The Burger Merger is happening. Four restaurant chains have signed on to Burger King's stunt to mash their hamburger recipes together to create a monster burger. 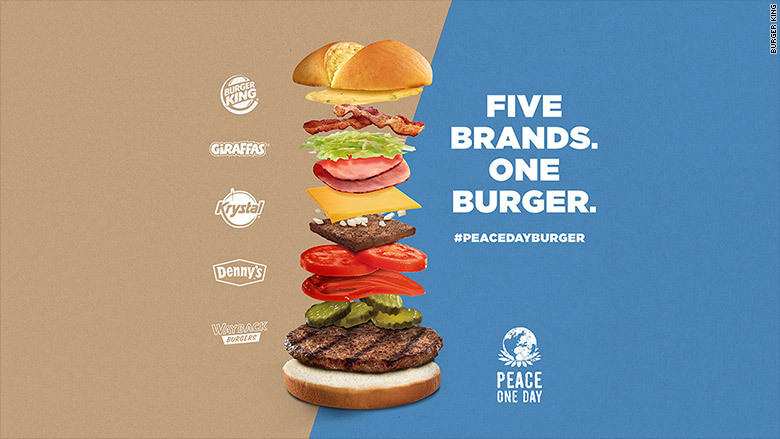 Burger King said Thursday that it will partner with Denny's, Wayback Burgers, Krystal and Giraffas "with the sole purpose of raising awareness for Peace Day." The five restaurants will make just 1,500 burgers to be given away at an Atlanta pop-up shop on September 21, a United Nations recognized day of "non-violence and cease-fire." Each company will also make a donation to Peace One Day, a nonprofit seeking to make the day widely observed by exposing 3 billion people to the idea by 2016. Burger King has already made a dent in that number. It made headlines when it took out a full-page ad in national newspapers asking McDonald's to join it to make a Peace Day "McWhopper." McDonald's (MCD) declined. Its CEO said the companies should "do something bigger to make a difference." Other companies quickly offered to collaborate, and Burger King embraced all of them. McDonald's, however, is still welcome at the table. "As far as McDonald's goes, any activity they undertake, whether in partnership with Burger King or on their own, would be incredible, as it will raise further awareness for Peace Day," said Fernando Machado, Burger King's VP of marketing. The world will get its first taste of The Peace Day Burger at 11 a.m. on September 21, when the shop at 1122 Northside Drive in Atlanta opens. Burger King picked the city because it's halfway between its headquarters and McDonald's.